Russian Prime Minister Dmitry Medvedev on Wednesday slammed the European Union and Cyprus for their handling of the island nation’s debt woes. 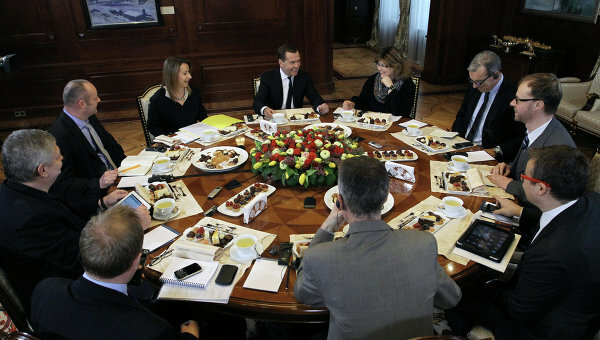 Medvedev told a group of European media outlets in an interview that the crisis had been entirely mishandled, undermining confidence in financial institutions, in Cyprus and beyond. “The actions of the EU, the European Commission and the Cypriot government to settle the debt problem unfortunately only resemble the actions of a bull in a china shop,” Medvedev said. Parliament in Cyprus on Tuesday rejected a government bill that envisioned a levy of 6.75 percent on deposits of less than 100,000 euros ($128,950) and 9.9 percent on larger deposits, which has been set as a precondition for securing an international 10 billion euro ($13 billion) bailout loan. The Cypriot banking crisis shows that expropriation of bank accounts and private property is not a thing of the past. The EU’s decision to raid the private bank accounts is compared by the Russian Prime Minister to some controversial decisions taken by the Soviet authorities in the 20th century. On Wednesday, Dmitri Medvedev criticized the European and Cypriot authorities for their actions in the context of the bailout of the Cypriot banking system. One of the reasons for the harsh reaction of the Russian Prime Minister is the unwillingness of the European authorities to take into account the negative consequences of their actions. Reuters reports that Dmitri Medvedev compared the actions of the European Union and Cyprus with the actions “of a bull in China shop”. He added that “all possible mistakes that could be made have been made by them”. RIA reports that Dmitri Medvedev described the “unique solidarity levy” imposed by the so-called Troika (ECB, European Commission and IMF) as “clearly confiscatory”, condemning its “expropriating character”. The Russian Prime Minister stressed that such actions are absolutely unprecedented and are very dangerous. “We are living in the 21st century, under market economic conditions. Everybody has been insisting that ownership rights should be respected,” he added. Dmitri Medvedev compared the actions of the European Union to the actions of the USSR authorities. “I can only compare it some of the decisions made… by Soviet authorities, who did not give a thought to the savings of the population,” he told Russian journalists on Wednesday. Reuters reports that a delegation of the European Commission, lead by Jose Manuel Barroso, will negotiate the future of Cyprus in Moscow. The negotiations are unlikely to be easy, given the negative reaction of the Russian authorities to the bailout package proposed by the Troika. The Cypriot negotiators have failed to achieve anything in Moscow, but their European partners are unlikely to be more successful. It seems that the Russian decision makers are quite unhappy that they haven’t been consulted prior to the rash decision to expropriate the money held in the Cypriot bank accounts. Cypriot parliament has come up with an alternative plan to stabilize the country’s economy by exiting the eurozone if its government fails to come to terms with the EU and IMF, a diplomatic source in London has confessed. According to the plan, Cyprus is considering leaving the single currency union while staying in the EU that would see its national currency, the Cypriot pound, restored across the island country. This measure could potentially help the Central Bank of Cyprus steer clear of the crippling economic and banking crisis. Cyprus has cited Iceland as its role model, saying it was on the brink of collapse in 2008 but managed to weather the budding crisis by pursuing an independent monetary policy.